Are you ready to join me in praying for our husbands in 2016? 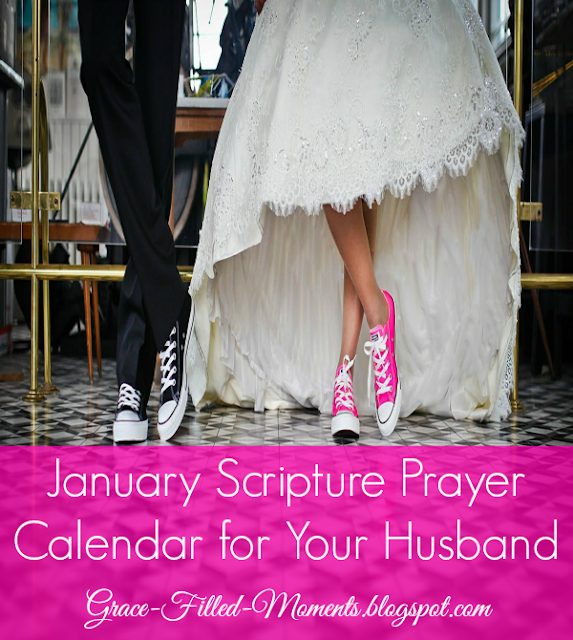 The January Scripture Prayer Calendar for Your Husband is ready for you to download for FREE! Our husbands have a huge task of being the spiritual leader in our homes and to love us as Christ loves the church. They can only do the will of God for their lives through perseverance and submission to Jesus and the indwelling work of the Holy Spirit. What a humble privilege for us to be able to partner with them by interceding in prayer on their behalf every day! God has promised us that His Word will not return void and that it will accomplish that for which it is sent out for. (Isaiah 55:11). Let's stand on God's Word as we pray the Scriptures for our husbands in 2016! You will find a new Scripture Prayer Calendar for Your Husband here at Grace-Filled-Moments on the first of every month. Be sure to subscribe (and confirm your subscription) by email so the FREE Scripture Prayer Calendar for Your Husband can be delivered straight to your inbox each month. Thanks for joining me as we pray together each month for our husbands! Download the FREE January Scripture Prayer Calendar for Your Husband simply by clicking on the image below! Thank you for sharing. I am a big supporter of praying for and with your spouse. Sharing with my readers. Hi, tialea2! I'm so glad you're here. Thanks for sharing with your readers! What a beautiful prayer guide you are offering to keep us intentionally praying for our husbands! I'm so glad I stopped by to visit from Worshipful Living! Aww, thank you so much Lori! Welcome, and I hope you'll check back in each month!